This website is not affiliated with Wealthsimple. It's a guide on how you can invest up to $36,200 of your hard-earned cash with $0 in management fees using Wealthsimple bonuses. Wealthsimple is a robo-advisor that manages investment portfolios based on intelligent algorithms with minimal human intervention (because humans are historically bad at picking stocks). They use low-fee index funds and technology to reduce the cost of traditional investing. When designing the perfect portfolio balance for you, they take into consideration your age, how much you can invest, your risk tolerance, and your goals. You then get to sit back and watch your money is grow in a diversified and regularly rebalanced portfolio. Why should you invest with them? You can start investing with as little as $1, so why not? Automatic portfolio rebalancing: Rebalancing a portfolio means exchanging investments in order to maintain your desired portfolio balance. A portfolio that is rebalanced annually has been proven to outperform the same portfolio without any rebalancing. But trying to do this fine-tuning yourself is basically a full-time job. Luckily, Wealthsimple does it for you. Talk to a real human Portfolio Manager over the phone, anytime. They're very knowledgeable and friendly, so don't be shy about asking them all your "dumb" financial questions. I've saved almost $500 in fees! Here's how to get your first $15,000-$36,200 managed for free for a year. Wealthsimple will increase your limit for investing for free from $5000 (the default for all new accounts) to $15,000. The author of this website will also be able to invest an additional $10,000 without management fees. If you want to say thank you for this website, at no cost to you, then use the referral link provided here. If you don't want to use this referral link, you can find others online and the author of this website will receive nothing. It's up to you. 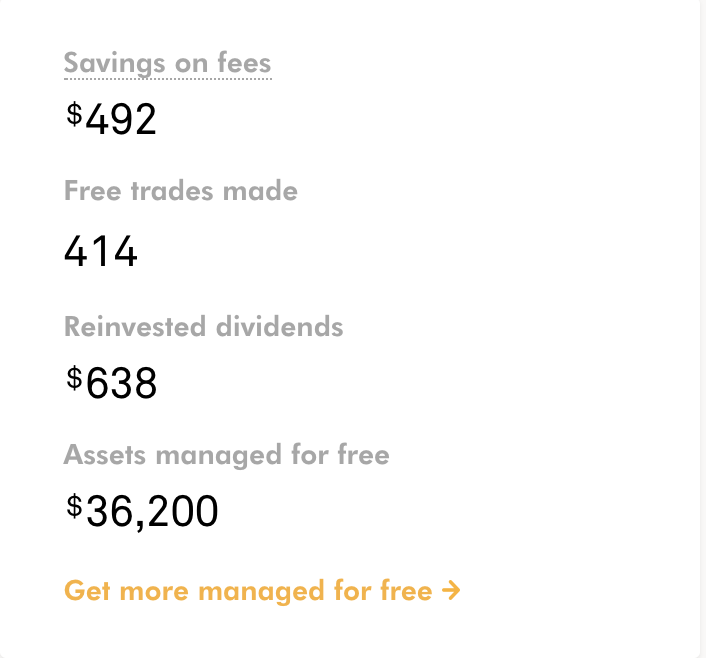 If you already have an investment account with another institution (such as a TFSA or RRSP if you're Canadian), then you can transfer that account to Wealthsimple and unlock an additional $10,000 invested for free. The account must have at least $5000 in it. Wealthsimple will cover any transfer fee that your existing financial institution might charge you. You just have to email them to let them know about the charge. Set up auto-deposits of at least $50/month from your bank to your Wealthsimple account to unlock an additional $1000 invested for free. It doesn't get easier than this one. Simply download the Wealthsimple iOS or Android app, sign in to your account, and get an additional $100 invested for free. From your account, go into Settings > Security and turn on two-step verification to increase the security of your online account and get an additional $100 invested for free. Use your own Wealthsimple referral link in order to invite a friend or family member to sign up and start investing. You will both get to invest an additional $10,000 without management fees. That's it! Your money can now work for you while you sleep.